When walking through the Cavalry Cemetery in Seattle, it is hard not to feel something slightly paranormal. Although I was not interrupted by any ghostlike figures, ephemerally passing through, I did sense a noticeable connection to history. Part of this connection came from the personality shown through the different grave markings, specifically when kin relationships were etched into the graves. 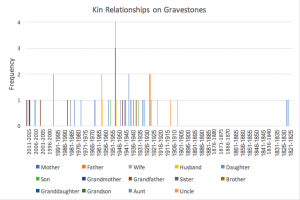 The kin relationships I discovered through our class collected data were Mother, Father, Wife, Husband, Daughter, Son, Grandmother, Sister, Brother, Granddaughter, and Aunt. The first thing I noticed was that certain female markers of identity were represented, but their male counterparts were not. For example, there was a grave marked with “Aunt”, but none with “Uncle”. This led me to assume this is because the relationships that women have in their lives are seen as much more essential to their identities, while male identities can be represented more often with just a name, or a type of quote. I also noticed that grave markers that contained kin relationship markers tended to be slightly more elaborate than graves without kin relationships. I assume if a family wants to use their resources to purchase a grave with a familial connection etched in, they are also more likely to get a stone that is large and regal enough to occupy that etching. Although I assumed graves that had family markers on it would be more likely to have other sorts of quotes, I found that many graves only had one or two family identifiers, a name, and no other type of message written in. If I had any doubts about the importance of kin relationships before visiting this cemetery, they were all kiboshed once I realized how may eternal resting places were forever marked with the role(s) they played in their family. This entry was posted in Death and Society '17, Historical Archaeology Class Blog (Winter '17) and tagged Cavalry Cemetery, cemetery, family by dornfb. Bookmark the permalink.